At the State of Product Management, you can expect fast-paced, interactive and fun sessions about the latest and most relevant topics in product management. In three tracks, you will take a giant leap forward towards building products everybody falls in love with. Get inspired by thought leaders' talks and hands-on workshops. Set better priorities, manage your personal growth, and increase your personal effectiveness across all levels of your career. Be prepared for sessions that will get you out of your bubble. Real stories from experienced product leaders, good food and drinks, and unique locations for the talks make for an all-inclusive experience. At the end of this day, you will feel re-energized and inspired, so that you can be a better master of yourself, with a stronger focus and a better balance. Join this one-day event and become inspired by some of the leading brands, craft your skills, learn to better manage your stakeholders, and learn about the best product management tools. Confirmed speakers include thought leaders, technologists and experienced practitioners like Lukas Vermeer, Senior Product Owner at Booking.com, Jorik Dopmeijer, Product Manager Retail Experience at Nike, Demian Sepp, Strategy Designer at Business Models Inc, Patrick Hurenkamp, Founder and CEO at Bloomon, and Chris Lukassen, the author of the bestselling book “The Product Samurai”. The Conference Day is Friday, November 16th. Hosted by Xebia. Starting at 12:00, sessions are scheduled till 16:30 PM + after party complemented by snacks and drinks. 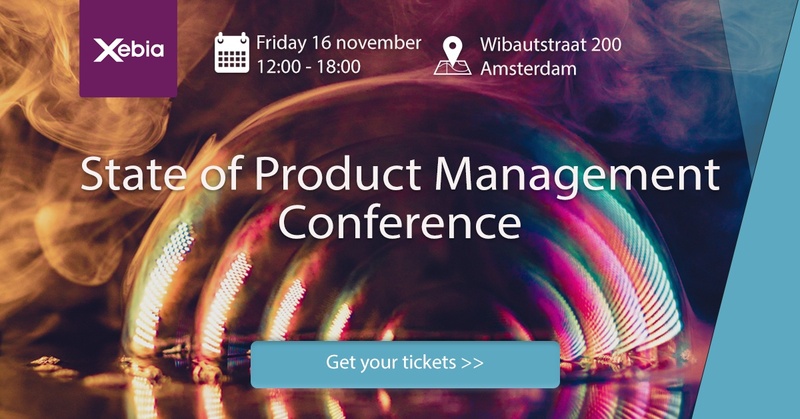 Attend the Product Management conference of the year! Please visit State of Product Management for latest updates.